The world’s leading quantum technology researchers came to the region for the sixth BQIT (Bristol quantum information technology) workshop. The conference at the Mshed looked at the state of the art of the growing quantum industry. Bristol is one of the leading centres for quantum research and development, building on research at the University’s Quantum Engineering Technology Labs but also with the Quantum Technology Enterprise Centre (QTEC) and the Quantum Technology Innovation Centre (QTIC). Speakers came from across the UK and Europe, and from the US, Japan, China and Australia. 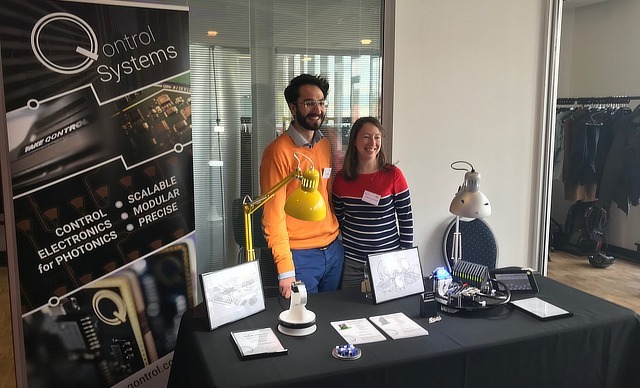 A poster session of the latest research was sponsored by Bristol-based KETS Quantum Security, while Qontrol Systems (above) were showing their latest high precision 16bit electronics for quantum systems. Jeremy Adcock from the University of Bristol presented the first device to wield four-photon entanglement, and measure state-of-the-art on-chip quantum interference for photonic quantum computing, while researchers from Delft in Holland are building the next version of the Internet around quantum technologies and a team in Nice, France, showed ways to synchronise the generation of photons as qubits in long distance telecommunications links.